Discovering a potential mold problem in your residential or commercial property can be rather stressful. Contact a trained and certified mold removal professional immediately properly address to the mold contamination. Mold is considered a bio-contaminate, and in most cases, it should be removed by a professional with the necessary equipment and training to safely address the problem. When it comes to mold removal, there are strict safety protocols in place to ensure the health and safety of all parties involved. Mastertech Environmental of Tidewater provides the safest and most effective mold removal services to home and business owners in Virginia. 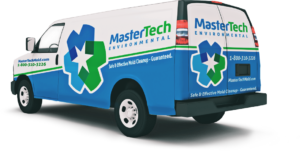 Mastertech Environmental is a top-rated mold removal company that has been featured on and trusted by HGTV & DIY Network. Our dedicated mold removal team is properly licensed, certified and insured. We use advance mold removal tools and technologies with the safest mold removal techniques in order to ensure everyone’s safety and guarantee the safest, most effective and most efficient mold removal possible in the Tidewater Region of VA.
At Mastertech of Tidewater, each mold removal technician must undergo intensive technical and safety training to ensure that the job is done right the first time. When it comes to mold remove, there is only one way to do it– the RIGHT way. In order to do so, we focus our attention on detail and quality control and will never compromise our standards for any reason. Where there is mold, there is an underlying moisture problem contributing to the mold development. Whether is it a water leak, excessive moisture that has been overlooked or untreated humidity or poor ventilation, these conditions need to be properly addressed in order to prevent recurrence. Mold can be safely cleaned from most surfaces without the use of toxic agents. In some cases, contaminated building materials may require safe removal and proper disposal. Mastertech technicians are trained in the most advanced techniques for the safe and effective removal and disposal of mold-contaminated materials. Our team takes advantage of oxidative technology, to provide the safest & most effective mold removal possible. This technology has transformed an industry that was once relying on hazardous removal methods that were developed during the 1980’s. Biological organisms require a unique decontamination protocol designed specifically to remove and prevent its regrowth. Mastertech Environmental aims to exceed industry standards and ensure the highest quality mold removal services possible in residential and commercial properties throughout the Tidewater Region of Virginia Our team is committed to getting the job done right the first time for our clients. We will never compromise our standards or our clients’ safety for any reason. If you answered “yes” to any of the above questions, you may have a mold problem that requires professional removal. Mastertech of Tidewater services all of the following areas throughout The Tidewater Region of VA.